Gray Paint Paint Low Water-based paint intended to protect the product while it is warehoused and in transit to the jobsite. Powder Coating Paint Low Baked on paint finish that is more durable than our standard paint and produces a better looking finished product. Zinc Coating Galvanized Low Zinc galvanized coating containing 0.90 oz. of zinc per square foot of surface area (total both sides). Galvanized Medium Galvanized (G185) 1.85 oz. of zinc per square foot of surface area (hot-dip galvanized per ASTM A653 total both sides). These products require hot-dip galvanized fasteners or fasteners approved for use with ZMAX. Stainless Steel (Type 410) with Protective Top Coat Stainless Steel Medium Carbon martensitic grade of stainless steel which is inherently magnetic, with an added protective top coat. This material can be used in mild atmospheres and many mild chemical environments. Galvanized Medium Products are hot-dip galvanized after fabrication (14 ga. and thicker). The coating weight increases with material thickness. The minimum specified coating weight is 2.0 oz./ft 2 (per ASTM A123 total both sides). These products require hot-dip galvanized fasteners or fasteners approved for use with ZMAX. Class 55 and 65 Galvanized Medium Mechanically-applied zinc in accordance with ASTM B695, Class 55 or Class 65. Stainless Steel Stainless steel High Products manufactured from Type 304, 305, 316 or 316L stainless steel provide greater durability against corrosion. 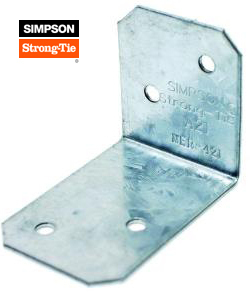 Stainless steel fasteners are required with stainless steel connectors, and are available from Simpson Strong-Tie. Types 304 and 305 stainless steels are not hardened by heat treatment and provide very good corrosion protection. Type 316 stainless steel is not hardened by heat treatment and provides the highest level of corrosion protection available, especially in environments with chlorides.